How can we consciously become “mad”? Ritual art is the art which awakens the ritual dimension of the human psyche. Rituals used to be an important part of any society; they gave people practical and concrete means to expand their consciousness and help them dealing with their everyday lives. Such practices were an art in themselves that contributed to the creativity of the human beings. In addition, they were an important part of the collective unconsciousness of people. Thus a kind of ritual dimension of the psyche developed in every woman and every man. The modern world has forgotten these kinds of rituals; many aspects of this dynamic reality are hidden from us today. The ritual art is based on ancient, archetypal rituals but it does not re-enact them. It examines scientifically, aesthetically and through self-awareness creative processes of the psyche and the body in their magical and timeless aspects. That is, it works with the source of our creativity which exists in our inner human root and reveals who we really are. It shows to us our so-called “core”, our source, our origin. 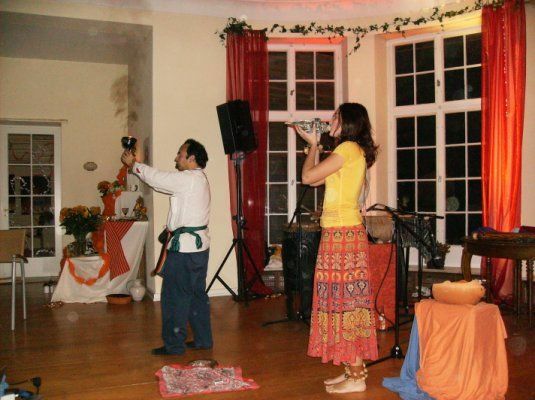 In this sense, the ritual art is focused on spiritual and creative development of the artists and functions as an inspirational and healing source for all the participants, both the artists and the “active audience” of the ritual works of art. This inspiration offers many possibilities of integration into our everyday lives. The ritual art is a dynamic and flexible art, which awakens the collective ritual dimension of the human psyche through different channels. It integrates different art forms: performing arts, visual arts, music, literature, etc; with psychomagical work. Hence, the ritual art is a mean to break away from reality and to achieve “conscious madness” in the sense of growth and freedom. Madness here means discovering and exploring our inner magical essence. It means recognizing our inner God and our inner Goddess and opening the door to different levels and the worlds through this sacred source. It means crossing the bridge between everyday life and the Impossible. The “conscious madness” was a way of wisdom, and this is how the art, science and culture had developed.Nahuals, shamans and witches have been using the ritual dimension of the Self since ancient times with the intention of creating and expanding their reality. They used the physical world to achieve “ conscious madness ” with the aim of transporting people into other times and transforming them into other “voices”. The voices of their own deep and pure Will. Throughout history these “rituals of madness” acquired dynamic performing qualities. They had profound effects on the human psyche. They were preparation for the rupture, “disintegration” of reality, so that every human being could experience and narrate life with it?s unlimited various opportunities, with its new physical time and intellectual, spiritual, liquid memory. This “training of madness” is a way to discover and activate the personal ritual dimension of the Self, the dimension of practicing dementia so that we can start relying on our own intuition and creative potential.